Rumford made light of testing conditions to claim the halfway lead in Qatar. 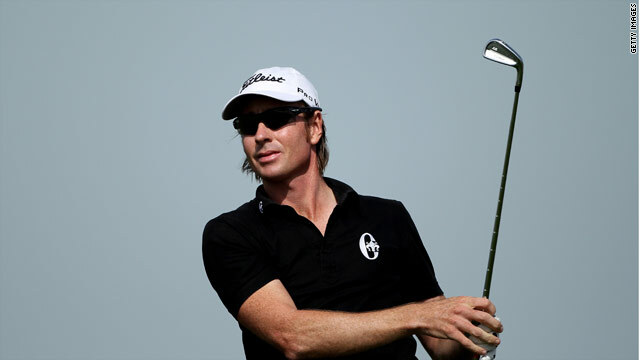 (CNN) -- Australia's Brett Rumford claimed the halfway lead at the Qatar Masters after a six-under-par 66 in testing conditions on the Doha Golf Course. Perth native Rumford dropped just one shot in his second round to go into the clubhouse on nine-under 135 with joint overnight leader Bradley Dredge in second place on eight-under. A clutch of big names are still in contention with Race to Dubai winner Lee Westwood and his Ryder Cup colleague Oliver Wilson just two shots behind. Wilson, who carded an opening round 67 in blustery and windy conditions, needed two late birdies to salvage a 70, while Westwood followed his opening 68 with a 69. The world number four admitted the early start had not been to his liking. "The conditions were easier and 64 or 65 would have been a really good score," Westwood told the official European Tour Web site. "I had a wake up call at 4.50am and I am not a morning person. I just could not put it together with my swing on the golf course. But I am still in contention for the weekend," he added. Peter Hanson (69) and Africa Open and Joburg Open winner Charl Schwartzel (69) are a further shot back with Ryder Cup stars Sergio Garcia and Paul Casey on four-under with Peter Lawrie and Ignacio Garrido. Rumford is returning to the European Tour after a disappointing season on the PGA Tour having headed there after winning the 2007 European Masters. "My goal is the world ranking points at the moment to get my ranking up higher," he said. World number 13 Kenny Perry of the United States just made the cut at two-over, but former British Open champion Todd Hamilton missed out after rounds of 78 and 75.